Today was our last full day in Dominica. We began the morning with several meetings to discuss the next steps in building the basketball leagues here. We met with the President of the Olympic Committee and the Minister of Tourism and felt that much was accomplished in those meetings. The people here have been so appreciative of our help, so it's been very encouraging. After our meetings, we headed to another TV station to do one more interview about our work on the island. With only two radio stations and two TV stations, everyone on the island recognizes us and talks to us when we come around! We then took a journey to Trafalgar Falls, which was a stunning sight. Aside from my wipeout on the rocks, we had a great time adventuring around the falls. Lunch was a homemade meal from Rhoda's mother (she's a great cook) which we took up to the Fresh Water Lake, 2,789 feet above sea level. We were above the clouds and ate our meal! They had a few kayaks there, so I was able to experience my first time on a kayak and it was definitely memorable. I wish I could describe to you what the experience was like, but I'm not sure it's possible. I'll just say that it was one of the coolest things I've done and I was able to see one of the most beautiful sights I've ever seen in this cove on the lake. It's something that you need to see for yourself. We are now staying overnight near the airport in the Atlantique resort, which is owned by he president of DABA. It's high up on a mountain on the Northeast side of the island, so I'm excited to get up to watch the sunrise tomorrow! This has been an unforgettable trip, but I'm ready to get home to my girls! God is good and He is faithful. I hope to come back to this island more often as we built great relationships with the people here! Thank you for your prayers and support. I hope you enjoyed reading updates, but this is the last one for now. Until next time. Supposedly, Sunday's begin in Dominica with a breakfast that consists of pig feet & cow skin. Or at least that's what our host said when she brought it to us this morning...um no thanks! We headed to town to worship with Salt Ministry Church and it was fantastic! We walked in to Carribean worship music and passionate believers (to see more of the worship, check my Snapchat: coachwingreen). The church consisted mostly of women, which we found interesting. When we asked about it we were told that the men on the island aren't interested in coming to church. I wonder if they know how awesome the worship music is? After church we headed about an hour North to Portsmouth to train the U16 National team again and also watch a college prospect game. On our way there we had to drive along very hilly/curvy roads with Speed Racer, A.K.A. our host, Rhoda. The road conditions were not great, but we made it there alive. All of us were feeling a little queezy when we arrived. There were a lot of good players actually, which surprised me. No doubt that 5 or 6 guys that were at the game could play at a high level collegiately in the states. After our training, two of our team members shared their testimonies and preached the gospel. Several of the kids in attendance raised their hand that they wanted to know Jesus as their Savior. Praise the Lord! We finished the night with some dinner and are now resting up for our last full day on the island. Tomorrow we are going to do some sight seeing, which I'm very excited about. Thanks again for praying for our trip! 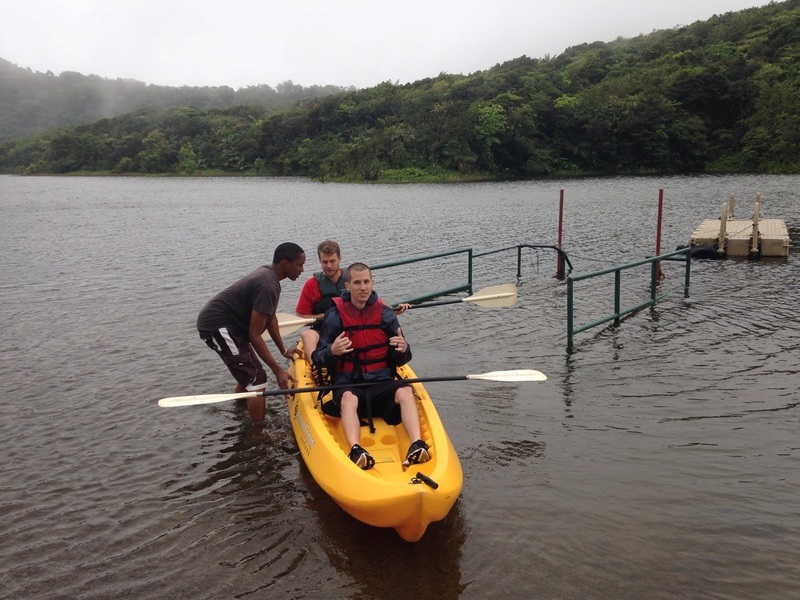 God is at work in Dominica. Today, we woke up to a hard downpour which continued the entire day. We instructed at a coaches clinic all day and gave them a crash course in anything and everything. Basketball is still in its infancy here on the island, so the coaches are in need of all the basics. From teaching players how to pass all the way to building and sustaining a culture, the coaches were hungry to learn. We mostly taught in the classroom using an old-school chalkboard, but we also braved the weather and did some drills on the court in the rain & puddles. Nonetheless, it was a great time and laid a solid groundwork for these coaches. Both myself and another one of our team members, Roosevelt, shared our testimonies and gave the gospel to the coaches. They were very receptive to what we had to say, so we will continue to pray for God to do a work in their hearts! The highlight of the day though, was definitely the passion fruit juice...it's by far the best thing I've ever tasted in my entire life. As I write this blog, we are currently sitting in a local barbershop watching the Warriors vs. Thunder game. It's a fun and unique experience! Thank you for your continued prayers - they are greatly appreciated. 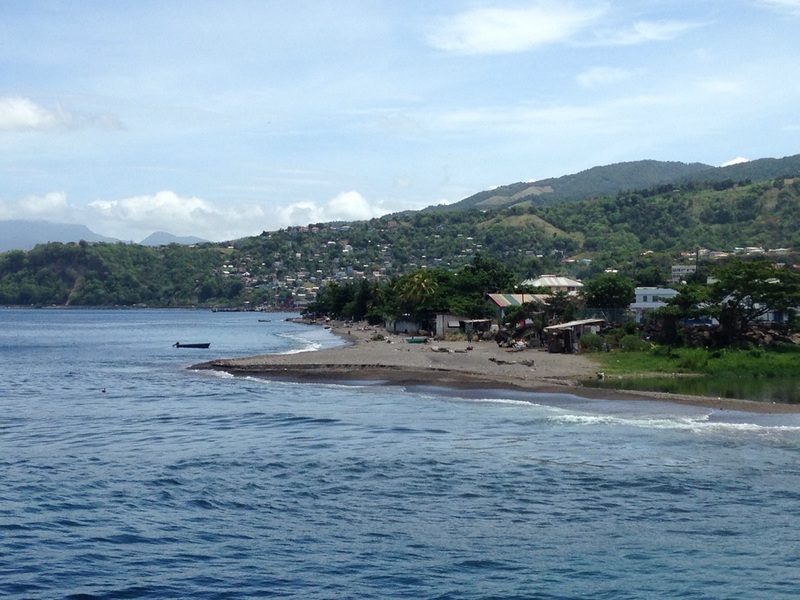 We are still traveling to Dominica...and won't get there until tomorrow. This morning we left Ft. Lauderdale at 7:00am and flew to San Juan, Puerto Rico. We then got on another flight and just landed in Antigua about 30 minutes ago. I'm taking advantage of the free WiFi while I can! We have one more flight tonight to Guadeloupe where we will spend the night. The guy leading our trip told us it will be a "cultural experience." Not sure if that's good or bad lol.